Satisfy your cravings with the official trailer and key art for Santa Clarita Diet, the new Netflix series starring Drew Barrymore and Timothy Olyphant. Netflix took many by surprise recently by revealing the gruesome subject of their upcoming original series Santa Clarita Diet, which debuts February 3rd - Cannibalism! In the show, Drew Barrymore and Timothy Olyphant play California real estate agents whose middle class ennui is shaken up when they discover the joys of human flesh. Now the streaming giant has released the show's first trailer. 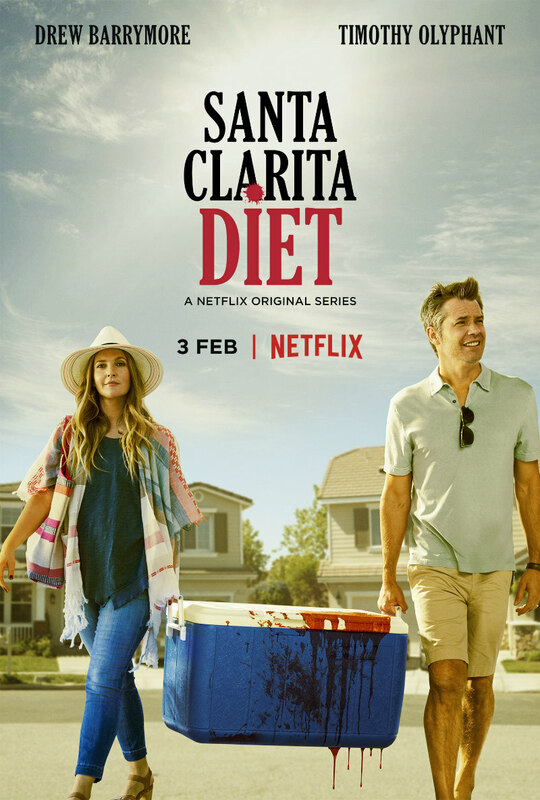 In Santa Clarita Diet, Joel (Timothy Olyphant, Justified) and Sheila (Drew Barrymore, Blended) are husband and wife realtors leading vaguely discontented lives in the L.A. suburb of Santa Clarita with their teenaged daughter Abby (Liv Hewson), until Sheila goes through a dramatic change sending their lives down a road of death and destruction...but in a good way.